I believe we are on the verge of a massive revolution in transportation that will equal in scale the introduction of the personal computer or the smartphone - and this revolution is going to happen in the next decade. The Revolution in Mobility will not only impact transportation as we know it but shape cities and how we live in the future in the same way that the introduction of the car or railroads originally shaped our lives. Let me explore the various factors and then try to draw some conclusion of how transportation in the future could look like. While a lot of research shows that fully autonomous vehicles would only make a meaningful impact in 2025 or beyond I strongly believe this is going happen much sooner. Google is deploying possibly 20.000 Jaguar iPace in 2020 and likely up to another 100.000 of their more cheaper models¹. This will easily replace 10x that amount of regular vehicles and likely the deployments will grow rapidly after that introduction. The reason why I believe a lot of automotive researcher companies vastly underestimate the speed of deployment and advancement of the technology is because they do not understand the exponential nature of development in some of the key areas driving autonomous technology such as AI (and computing) and Sensors (Lidar) etc.). They are used to more linear developments (as common e.g. on regular engines) and have for the same reason consistently underestimated e.g. 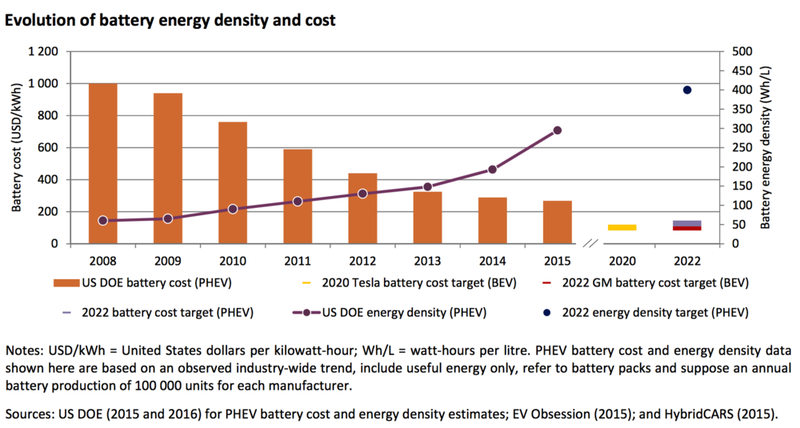 the deployment of Solar Capacity, or the drop of battery costs for electric vehicles. Therefore I believe we will have by 2025 millions of robo taxis in operation that will replace tens of millions of regular cars and I would be surprised if not the majority of cars in 2030 sold would have full autonomous capability and even more so if by then not the first country like Dubai or Singapore would ban non-autonomous vehicles on the road. Ultimately the sensors which will make a car autonomous and the software will be highly commoditized and not result in a substantial increase in price but massively add to the safety of vehicles, and be an absolute standard like Airbags today. We already see that with smartphones people are much more open to use various mobility services. While this began with people using Uber, Lyft, Didi and others - clearly new forms are emerging like Bikesharing services (e.g. GoBike) or Electric Scooters as well as carsharing services like DriveNow and Smart2Go. Ultimately those will play a major role for the on-demand transportation economy and will provide seemless integration across a wide spectrum of services. The key driver is that especially in cities people will be more and more open to not own a car but on-demand book a service that fullfills their need - be it a car with a driver or more environmentally friendly services like Bikesharing. One missing link at this moment are apps that are integrating all those services, and Google Maps is already making steps into that direction or another key contender in that space is CityMapper. 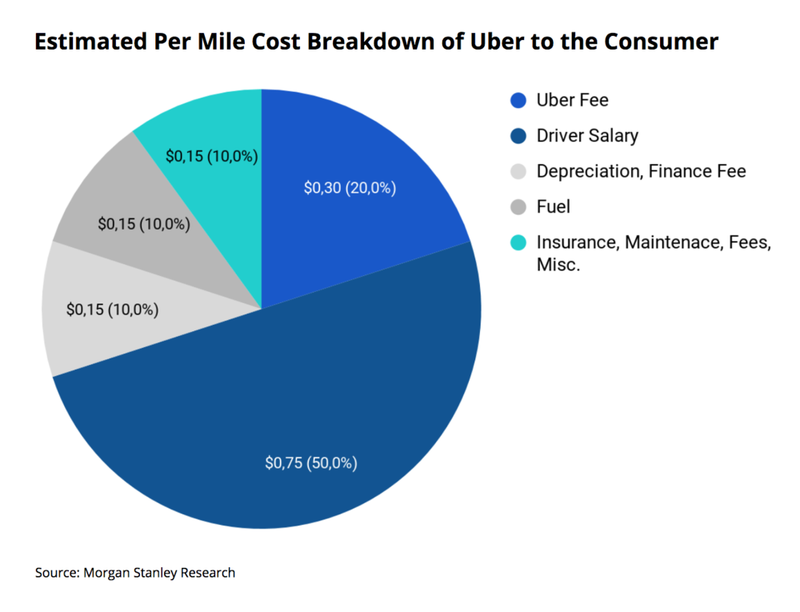 The cost of a RideShare mile currently is approximately $1.5 as per Morgan Stanley - however 50% of that is the driver salary and another $0.3 are the Uber Fee. So likely even initially this could be going to as low as $0.45 purely for the ride per mile, and possibly lower if somebody builds really low cost ($10-15k) autonomous vehicles as well as reduces factors like Insurance due to lower crash rates and lower fuel cost with purely electric fleets. So I think by the mid 2020s we are looking at a cost per mile around $0.25 - therefore less than half the cost that people pay for their own vehicles². Even right now there are already services starting that calculate in which cities and for which users it's cheaper to rely on Uber than owning a car³. A major area of transportation is delivery - and besides an autonomous car one interesting gap is the last mile delivery problem. A very interesting take on this is the startup by the original Skype Founders⁴. With an infrastructure of autonomous vehicles in place and a solution for last mile delivery we will see a massive reduction of delivery costs by a factor of 3-5x based on current cost and this will allow services like Food or Grocery Delivery to operate at totally different economics and put massive further pressure on already challenged retail stores and further reshaping the cities. I think in the future it will be totally normally to have a small order brought to your home within less than an hour by an autonomous vehicle equipped with an autonomous last mile delivery robot at a cost that is possibly cheaper than the neighborhood store. Elon Musk has eloquently stated that drones share one problem that they are very hard to operate consistently in all weather conditions and also safely at all times. Tunnels however can be dug in multiple layers and possibly at a low cost. If this succeeds and people can commute in tunnels with personal shuttles as well as more public mobility services - this could be another major factor to reshape transportation. To give an Over the Top example a Reddit user has calculated that it is cheaper already to rent in Las Vegas and Fly 4 days a week to SF instead of renting in SF⁵. 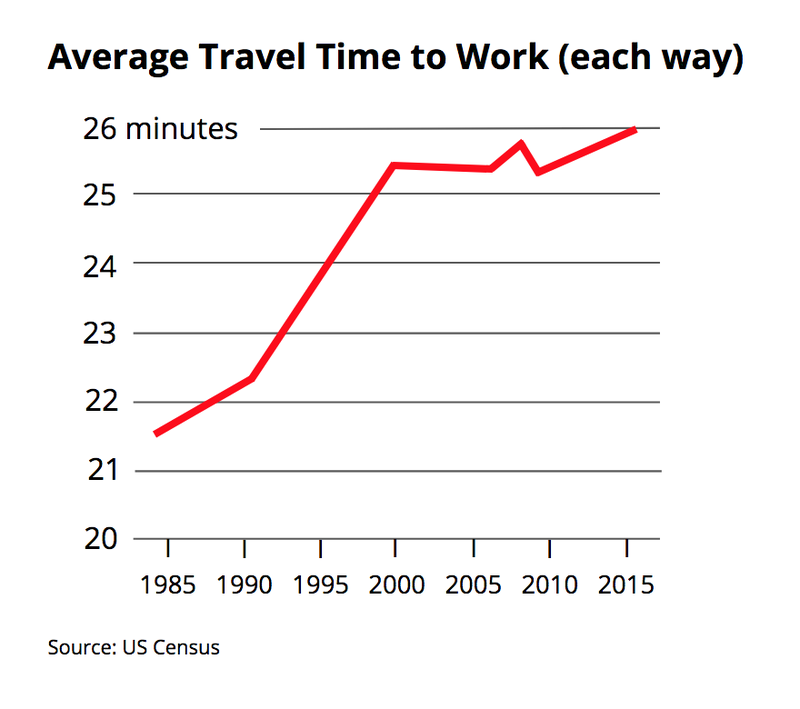 While this certainly is a crazy example and has many lifestyle drawbacks, I can certainly imagine people being willing to commute by Hyperloop for 30 min, and with the forcasted speeds this could get you easily 300 km (200 miles+) from an Urban Center - and ultimately I believe the business model for Hyperloop is not in transportation charges but very similar to the original railroad companies to buy up land next to the stations. I can already imagine cities in 100-200 km distance of major Urban centers popping up that are conveniently connected via a 15 min. Hyperloop ride to downtown of that city and the company building those cities can likely make billions in dollars of revenue on that side. Usually truly remarkable change happens when a service morphs into being a platform - in a similar fashion how Personal Computing has been a platform that lead to grow companies like Microsoft and the iPhone has create billion dollar companies like Uber I believe Transportation as a Platform will be a trend creating many unicorns of the future. In a similar fashion like Amazon has made available large scale computing infrastructure available to every startup and had a major impact on lowering the cost of starting a company - I believe there will be a Player that will make Transportation as a Service available as an API for other companies to build on top. No matter if you want to have a neighborhood store and add almost instantaneous delivery or start a new chain of Robo Restaurants I believe transportation of both goods and people will become a service you can book via an easily available on demand API in a same way that AWS has done for computing, Stripe has done for Payments. If I would start a company now in the transportation space that would likely be a company that could leverage that platform of low-cost / easily accessible transportation and rethink what could be possible if that is available. I think we are in a similiar stage with transportation - where we image self-driving cars like a car without a driver - but what I am way more interested in exploring is what consequences this has and how we can reshape cars of the future when we go beyond removing the driver. Early stage attemps probably will look silly in 10 years but likely anything from training on an exercise bike as to getting a haircut or showering will be possible⁶. One thing is for sure: The future is going to be exciting - and I am truly lucky to have had a chance with my previous startup skobbler to be there when the Smartphone revolution happened and be there in the next industry that is going through cataclysmic change and to be now with Telenav in the mobility field as the industry is now also going through cataclysmic change and will change the world as we know it. ¹ Higgins, Tim, Dawson Chester. "Waymo Orders Up to 20,000 Jaguar SUVs for Driverless Fleet" (2018). wsj.com. ² Stepp, Erin. "Your Driving Costs" (2016). aaa.com. ³ Ride or Drive. "Should I own a vehicle or commute using ridesharing services?". rideordrive.org. ⁵ Jaffe, Eric. "Crazy or Brilliant? Commuting From Las Vegas to San Francisco to Save Rent" (2015). citylab.com. ⁶ Ramsey, Jonathon. 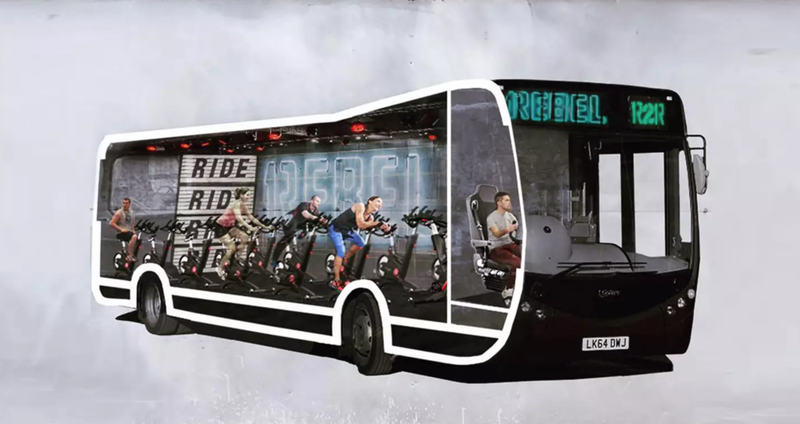 "London’s 1Rebel Gym Puts a Bike Ride on a Bus Ride" (2016). thedrive.com.